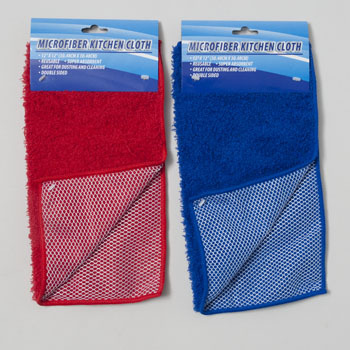 Multi-Purpose, Great for Scrubbing, Cleaning and Polishing, Link and Streak Free, Highly Absorbent. Textured (Scrubber Side) for use on Non-Delicate Surfaces. Great for Cleaning Dishes, Bakeware, and Pots and Pans. Reversible - Fabric Side is Safe on Glass, Polished Wood, Stone, Stainless Steel, and Most Electronic Equipment. Size: 12 Inches Square. Fabric: Microfiber - 100% Polyester. Care: Machine Washable, Tumble Dry Low.